The traffic situation in Metro Manila has become indescribable. Traveling between Makati City and Quezon City easily takes four to six hours of a commuter’s day. Worse, during the rainy season, Metro Manila grinds to a halt thanks to flood-prone streets. Studies say that at least P2 billion is lost daily due to the effects of severe traffic congestion in the National Capital Region. Unfortunately, under these circumstances, to the individual soul in the traffic jam this figure has little meaning; for each person stalled during rush hour, it is wasted time, fatigue, and a frustrating quality of life that matter most. This long-tolerated grievance manifested with a vengeance in last May’s presidential elections. No one in the Aquino administration probably foresaw the backlash their candidate, Mar Roxas, would receive as a result of the monstrous traffic jams. The perception in Mega Manila, which traditionally swings votes for presidents, was that President Aquino’s administration failed to address the plight of residents of Metro Manila or the neighboring provinces. The construction of connector roads and highways did not commence immediately as planned. The rail systems failed to get needed improvements or sufficient maintenance, to such an extent that trains running smoothly were news items. Even the seaports and airports were congested. Yet, all the government could say was that the abundance of vehicles was a sign of economic progress. When President Duterte assumed office, his projection of a strong political will and a no-nonsense style of governance gave a new sense of optimism. The new government immediately showed its contrast with the old by quickly initiating its activities. However, after more than 100 days since coming into power, not much has changed in terms of Manila’s traffic congestion. All we have is a unified traffic management command under the Inter-Agency Council for Traffic and the Department of Transportation’s move for emergency powers, that it hopes will give it guns big enough to solve the traffic crisis. For land traffic, the Department of Transportation has asked for emergency or special powers for: the use of alternate roads, the creation of a single authority to formulate and enforce uniform traffic rules, fast-tracking the procurement process, preventing injunctions by lower courts, the acquisition of right of way, the prohibition of transport terminals along major thoroughfares, and the rationalization of routes to improve efficiency of public transport. If well defined and delimited, all these could help solve the complex problem. 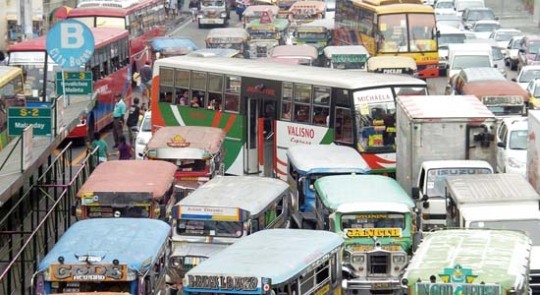 Despite this, the root cause why Metro Manila, or perhaps even the rest of the country, finds itself in a situation of unbearable traffic is the lack of foresight on the part of our leaders. Administration after administration, the government is in crisis mode, putting out constant fires instead of looking for durable, strategic solutions that bring together all of the country’s transportation network. The Philippines needs “hard” solutions, such as modern railway systems that will serve as an efficient and cheap distribution backbone for goods and the safe and comfortable commute of millions of riders. In the 1960s and 70s, the Philippine National Railway system was the transportation backbone of Luzon, with commuter and freight trains regularly running from north to south. Today, Metro Manila and a few towns in Laguna see few commuter trains. We must upgrade our network of roads and bridges, creating routes faster than EDSA and C5. Yet, building roads is one thing, but proper road use is another. This is where traffic enforcement and a disciplined driving culture comes in. The efficient use of existing infrastructure will need “soft” solutions. Part of these soft solutions are the information and communications technologies that introduce creative and often disruptive innovations to address problems differently. One visible and much appreciated innovation that we encounter daily is the countdown traffic lights, which reduce impatience of waiting for a green light and enhances safety by helping drivers anticipate red lights. There are other ways technology can help traffic and law enforcement. A unified database of public and private transport could empower policemen with information on each vehicle and driver. This one function will already discourage colorums, carnapping, and other illegal and unsafe activity on the road. Other powerful tools include the software applications in our phones have become indispensable tools to find the shortest and fastest route to your destination. Ride-sharing services have offered a convenient and safe alternative to hailing for a ride home in impossible rush hour conditions. These tools give motorists a means to outsmart the rush hour monster. The government could plan for these technologies to be adapted for the commuting public, to encourage them to navigate the public transport system as it further develops. The time has come for out-of-the-box solutions, which combine an appreciation for both hard and soft solutions and a commitment to long-term thinking. These solutions can capitalize on new and old technologies that can move more people around the metro in fewer vehicles, and give people a viable reason to leave their cars at home. As this new government has clearly taken a position of strong and determined leadership, an openness for innovative and disruptive “soft” solutions will go a long way while we wait for our “hard” solutions to get built.